Nice large pair of shakers would be nice to sit on the range. Measures 3 1/2" tall and has nice handles. 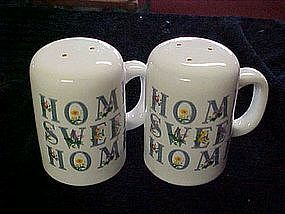 Decorated with words, HOME SWEET HOME, and in each letter there are flowers. From House of Lloyd. Original plastic stoppers and in great condition with no damages.